Did you know that Friday the 13th is happening in October this year? If you want to do it right, you should probably head to Biloxi, Mississippi for the Fear Fete Horror Con & Film Festival. If you love gaming, you might as well stick around for the Gamer Fete Gaming Con. That’s right, both of these events are happening at the same time and you could gain entrance to both for one low price. This event will be one of the most epic horror experiences of a lifetime. You’ll have the chance to take pictures with some of your favorite celebrities and pick their brains at the Q&A panels. The Fear Fete Film Festival will allow you to watch some of the newest horror films from around the world and meet with the teams that created them. You could even submit your own film to the festival. This horror convention simply wouldn’t be complete without a costume contest, so put together your scariest look and show them what you’ve got. You can register to enter the costume contest up until October 15th. 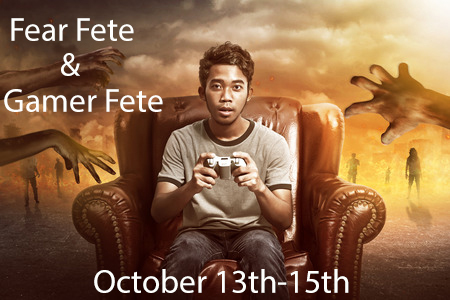 No matter what type of games you’re into, Gamer Fete Gaming Con is where you’ll want to be. Gamer Fete has teamed up with SuperCon 2K Series to bring one of the largest Super Smash Bros. Tournaments to this event. This is the place for all gamers to unite and compete in tournaments for over $5,000 in cash prizes. If you don’t want to compete, there are plenty of options for casual play, including tabletop games. As mentioned before, no real convention is complete without a costume contest, so be sure to register for the chance to win a prize. Both of these events will take place at the MS Coast Convention Center in Biloxi, Mississippi on October 13th through the 15th. Although you can buy tickets at the door, it’s highly recommended that you purchase them online in order to avoid long lines and ensure that tickets are still available. If you’d like to attend both events, visit FearFete.com to choose between the weekend combo pass or the single day admission for Saturday or Sunday. Put on your best costume and prepare for the most epic weekend ever.